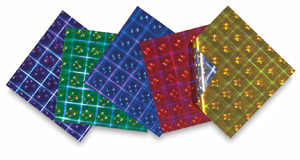 This assortment includes instructions for 14 origami projects,and 5 colored sheets with intriguing hologram patterns that dance in the light on the surface of a finished origami piece. Colors include Red, Gold, Green, Blue, and Purple, each color backed with holographic Silver. Papers and coatings are non-toxic. Individual sheets measure 15 cm × 15 cm (5-7/8" × 5-7/8", the width of an A5 sheet).